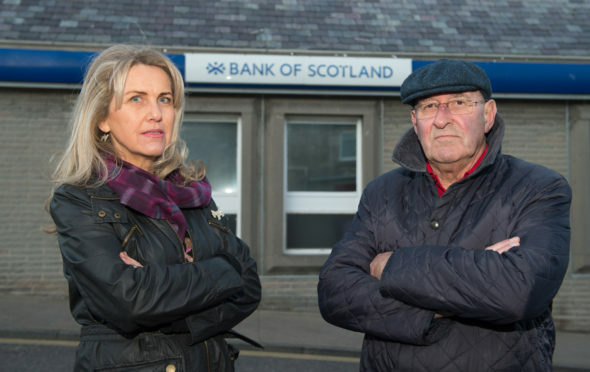 Lossiemouth Community Council vice-chairwoman Carolle Ralph and chairman Mike Mulholland outside the town's Bank of Scotland branch. The coastal town will lose its last bank building when the Bank of Scotland closes its branch later in the year. The community council has now written a letter to other financial organisations listing the benefits of having their business in the Moray town. It states that a new branch would attract customers from across the Heldon and Laich region along with visitors and tourists who use the caravan parks and marina. Businesses across the region will also benefit from the multi-million-pound expansion of RAF Lossiemouth with the influx of military personnel. It’s hoped that the letter will be backed and signed by community leaders as well as politicians such as MSP Richard Lochhead and MP Douglas Ross. Chairman of Lossiemouth community council Mike Mulholland hopes that this “final throw of the dice” will bring in a new bank. He said: “We have written about all the positive aspects of the region and will send it to all the banks that haven’t been based in Lossiemouth. “We are a growing area and will continue to grow and the community will back them as well. “We want to have a bank come and become established here – that would be a victory for more than just Lossiemouth. “I don’t know what we will do if this does not work unless somebody else comes up with a better idea. The Bank of Scotland last year confirmed that its branches in Keith and Lossiemouth would close this year following a “difficult decision” due to a dwindling amount of customers. The move means that Lossiemouth will be left without any permanent banks for the first time. However, the bank had stressed that a new mobile service would be launched in their place.